Four weeks in Germany seeing the best! We’re now in Berlin. 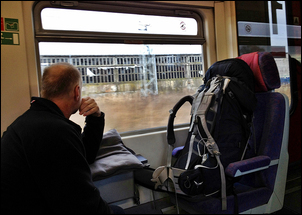 We took the ICE train from Nuremberg, a trip of about four and a half hours. Much of the journey was on tight, winding track – think Adelaide Hills – and so the ICE never had a chance to stretch its legs. The highest speed we saw on the in-cabin display was 200 km/h – just loafing! 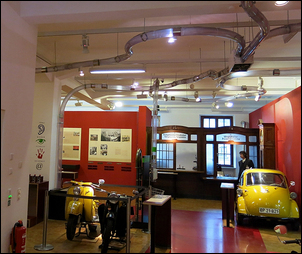 Before we left Nuremberg, we went to the DB (German rail company) museum. Surprisingly, this wasn’t that good. The interpretative signs were all in German (no English) and there was little full-size rolling stock. In fact, the best part of the museum actually had nothing to do with trains. The museum incorporates a Museum of Communication – something that had sounded rather boring but was nothing of the sort! The museum interprets its ‘communication’ charter in the broadest of terms, so has everything from hieroglyphics, to cyphers, to telegraph, telephone, radio and TV, and postal displays. The telephone display was like nothing I have ever seen before – real (old) telephones connected to a real (old) exchange… with everything working! So you could pick up the handset of a 1950s phone, dial the number of another phone located nearby, then watch the electro-mechanical selector switches in the exchange rotate to make the connection. And not only did they have the working exchange, they had three of them - so you could see the change in telephone exchange technology right up to the advent of digital connections. As with the telephone display, many of the activities were hands-on, and with literally not another soul in the museum when we were there, we could try out whatever we wanted. So we had a go writing in ink on paper with quills, with feathers, with pens made from bamboo. We tried out the pneumatic tubular document transport system of the sort still used to send money from cash registers in many department stores and shops. I even recorded a short TV broadcast that I was able to email to my home address! A really great museum with plenty to see, plenty to do and plenty of scholarship behind it – oh, and signs in English too. 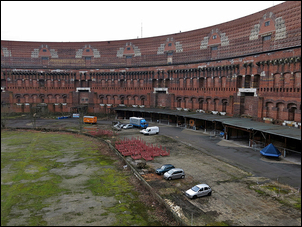 Prior to leaving Nuremberg, we returned to the Nazi Rally Grounds. I wanted to visit the museum located within the partially constructed Congress Hall (the huge, crescent-shaped building that remained unfinished at the end of WWII) and we also visited the Luitpold Grove, another iconic structure often seen in Nazi propaganda films of the era. The museum in the Congress Hall is an excellent one - if you want to learn about Germany in the time of the Nazis: what they did, how they got into power, and how it ended. I’ve read extensively on these topics so I didn’t get a lot out of it – but I could see that many other people certainly did. 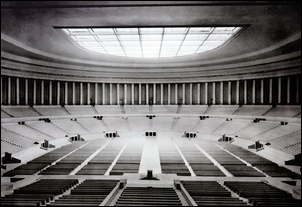 What was missing for me was the history of the Congress Hall itself – the structure is so hugely impressive, even after all these years and even with it perhaps only one-third complete - that I thought it deserved far deeper coverage. The museum is located within one of the squarish buildings that abuts the crescent construction; unfortunately, you don’t get into the interior of the main crescent structure at all. However, I was able to walk to the interior of the huge ‘C’, putting myself in what would have been the middle of this giant hall. Looking up at the three storeys, and imagining another one-third in wall height, all enclosed by an enormous roof, was quite disconcerting and powerful. Berlin is a big city. It has a big city feel, big city graffiti, and as we found with London last year, the capital is a magnet for tourists. We have seen almost no tourists in Germany until we reached Berlin: here, there are literally thousands thronging the streets. We find it rather offputting: the selfies in front of the Brandenburg Gate, the Reichstag Building being photographed by milling crowds. I get an awfully strong feeling that many people are here so that they can tell others they’ve been here – and have the photographic evidence to prove it! 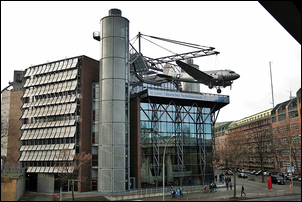 Today we went to the Berlin Deutsche Technikmuseum. 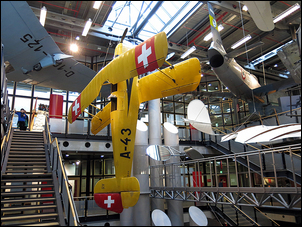 This is one of those glorious German museums in the mould of the Deutsches museum in Munich, or the Sinsheim Technic Museum. This one had boats and trains and planes and cars (cars that we missed: it’s a separate part of the museum across a road); manufacturing techniques; a fascinating exhibit on a German computing pioneer (more on him in a moment); an extraordinary display on radio and TV better than I have ever seen in my life; and an excellent display on still and movie cameras. 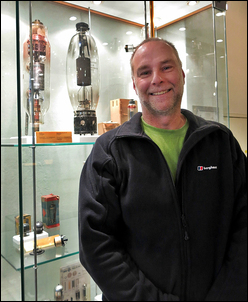 The radio and TV display included the complete broadcast transmitter constructed immediately after WWII to allow the Allied powers to communicate with the population; vacuum tubes (valves) that must have been more that 40cm tall; and even a complete 1960s TV studio. They also had a wonderful selection of pre WWII domestic TV sets, and had on display what must be the rarest of the rare – a John Logie Baird spinning disc TV receiver… something from the very first TV system. The exhibition on computing was very interesting – and not just for technical reasons. Germany claims the digital computer was invented in Berlin by Konrad Zuse, who in 1938 finished construction of a mechanical computer (the Z1). In 1941 he constructed the Z3, using 600 relays for switches and memory. The museum claims this to be the world’s first fully functional computer. 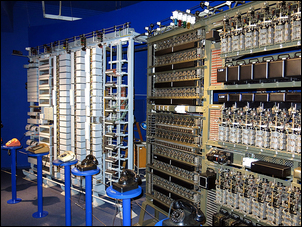 Of course, for English speakers, the world’s first electronic computer is usually stated as being Colossus, built by the British in WWII to help (ironically) break German codes. But sixty seconds of web research reveals the complexity of trying to ascertain who was first – are you talking mechanical, electro-mechanical, electronic, programmable or non-programmable computers? However, as is the case with the German technical museum coverage of the development of the jet engine (Frank Whittle? – who was he?) , it’s interesting to see technical history displayed in a way quite foreign to me. The aviation and train sections of this museum were fabulous. The Horten Ho II L flying wing – looking so modern yet developed in the 1930s – and, spiritually at least, on the path that led to the B1 stealth bomber. 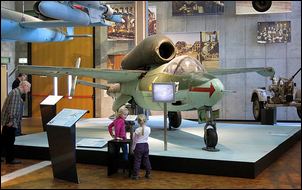 The Heinkel He162 – that aircraft that initially looks like a conventional piston-powered WWII aircraft - except it just happens to have a huge jet engine mounted on top of the fuselage - but when examined closely, reveals some surprising airframe attributes like downwards-facing winglets and a unique tail. In the train museum there were a lot of interesting full-size exhibits, including an 0-10-0(!) steam shunting engine, and – very soberly – a goods truck used to take Jews to the extermination camps. I stood inside this van, just to (obviously, inadequately) try to experience and understand. There was also a gloriously huge and streamlined German diesel railway locomotive of the 1950s – something that to appreciate, you’d really need to see from about 400 metres away, striding through the countryside and pulling a long line of coaches. But we were pushed for time, so these are the highlights of only about 3 hours… it’s another museum that deserves a full day! Georgina is sick, so we had to call off our plans for the rest of the day (they involved a tour of Berlin’s underground bunkers from WWII and the Cold War) and head back to the hotel. I hope she is feeling better tomorrow! 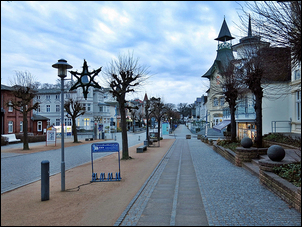 This is our second night in Zinnowitz, on Germany’s northern Baltic Sea coast. The story is a mix of good and bad – the ‘bad’ being that not only is Georgina still sick, but now we’re all sick! It’s not anything life-threatening, just a nasty flu type of bug that mixes body aches and pains with occasional nausea and cramping diarrhoea. 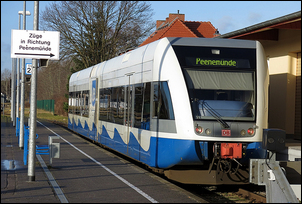 Yesterday we’d designated a travel day, so we didn’t need to do much except (slowly) get to the Berlin railway station and then take the train to Zussow, where we got on a regional branch line to Zinnowitz. A quick perusal of Wikipedia (http://en.wikipedia.org/wiki/New_states_of_Germany) shows those impressions are borne out by the socio-economic statistics. Watching the view out of the window, I started to wonder how crappy Zinnowitz would be – but in fact it is a beautiful seaside village with excellent facilities and a lovely feel. 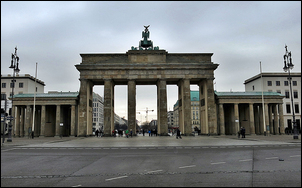 And we can’t spot even one other tourist – a radical change after Berlin. So why have we come to Zinnowitz? Perhaps a location that is nearby will tell you the reason: Peenemunde. Yes, literally just up the spur railway line is the former site of the Peenemunde Army Research Centre – where the modern, liquid-fuelled rocket was born. 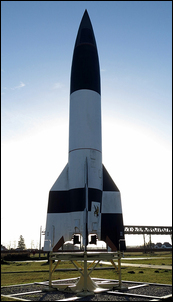 The V2 missile developed at Peenemunde in the 1940s is a direct precursor to technology that put men on the Moon, that puts satellites into space and – less positively – drives missiles. In terms of technology developed by people in the last century, liquid-fuelled rocketry is right up there with the most significant. 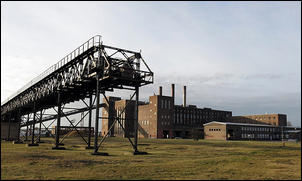 And at Peenemunde the V2 was developed by technical geniuses working in one of the most advanced technical facilities anywhere in the world – geniuses who had a complete disregard for the quality of life of slave labourers and concentration camp inmates who were forced to work for them. I think no-where are the contradictory elements of the Third Reich so clearly encapsulated – technology that led the rest of the world by 20 years, yet occurring under the auspices of moral bankrupts. Today we took the train to Peenemunde, and then visited the museum. Within these buildings is a very interesting display of artefacts, photographs and text (most also in English, and an English audio guide is available). In many ways, Peenemunde is more a cultural museum that a technological one. The museum takes a very even-handed approach to history: neither downplaying the significance of the technology developed there nor pretending that all was sweetness and light. Interestingly, when the museum was first mooted, the German aerospace industry wanted the site trumpeted as “the birth of space travel” but there was an outcry that such an approach would represent a modern disregard for the realities of Nazi history. For my money at least, I think that the current museum strikes an admirable balance. It would be easy to write a book about the V2’s technology: cutting edge in supersonic aerodynamics, rocket engines, inertial navigation guidance, graphite materials development (for the steering vanes in the rocket efflux), pump development (the turbine pump for the fuels is an extraordinarily compact and powerful work of art)… it goes on and on. And it gives you an eerie feeling to look through laminated sheets of original engineering documents, many hand-written with sketches, that show some of this technological development. But then there’s that other side of the coin again…. As a military weapon, the V2 was largely unsuccessful – it is suggested that more people died producing the V2 than were killed by its military actions. At Peenemunde there is also a separate U-boat (submarine) museum, but by the time we’d finished the rocket museum, our bugs were overwhelming us and it was time to totter back to the train…. Tomorrow, we head to Hamburg. You don't need an expensive factory towbar harness - even on CAN bus cars. Getting the Good Parts from Scanners!